Ask any pianist and they will tell you that no two pianos are quite the same. Each instrument has a sound and character all its own. 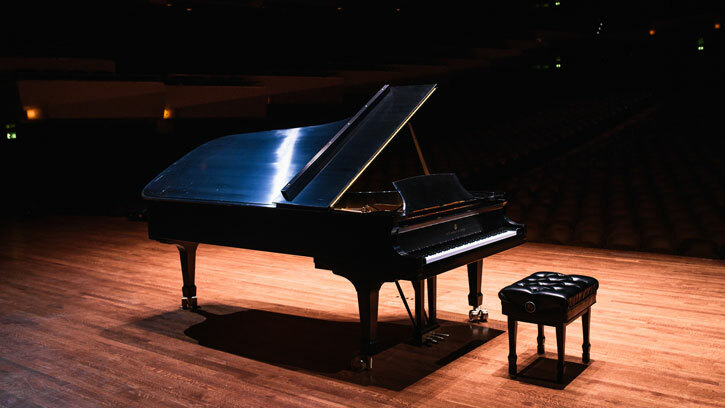 Pianos created by Steinway & Sons are considered to be the gold standard of concert grand pianos, so when the opportunity arose to add a new Steinway to the Seattle Symphony’s collection, the choice was clear. Known as the Model D, Steinway’s concert grand pianos are the overwhelming choice of pianists the world over. The purchase of a new piano for the Symphony was made possible by a generous gift from Seattle Symphony Board member Judith A. Fong and her husband Mark Wheeler. Selecting just the right piano for the Seattle Symphony began in August 2015 at the historic Steinway & Sons factory in New York City. Founded in 1853 in a Manhattan loft by German immigrant Henry Engelhard Steinway, the company has had a factory in the Astoria neighborhood of Queens since the 1860s. Representing the Seattle Symphony were Judith A. Fong and Mark Wheeler, Music Director Ludovic Morlot, Vice President of Artistic Planning Elena Dubinets, Vice President of Development Jane Hargraft and Director of Operations Kelly Woodhouse Boston. They were joined by world-renowned pianist, and favorite guest artist here in Seattle, Yefim Bronfman, who would assist with the selection. Representing the Seattle Symphony during the Steinway & Sons visit, from left to right, Vice President of Artistic Planning Elena Dubinets, Music Director Ludovic Morlot, Board member Judith A. Fong, pianist Yefim Bronfman, Director of Operations Kelly Woodhouse Boston, Vice President of Development Jane Hargraft and Mark Wheeler. During their tour of the Steinway & Sons factory the group was invited to observe every aspect of the construction process. Each piano is hand-built by a team of dedicated craftsmen, much the same as they have been since the company’s founding. Steinway & Sons presented six pianos for testing. To make the piano selection, Bronfman played a wide range of pieces on each of the pianos to demonstrate the qualities of each instrument in different types of music, then discussed the merits and qualities of each instrument with Ludovic Morlot, Elena Dubinets and the head technician at Steinway & Sons. The piano had to have enough heft and brilliance to be heard in Benaroya Hall, but also the delicacy needed for recitals. After much consideration, the choice narrowed to two pianos. All Steinway cases start in the frame shop. 18 layers of maple are glued together and clamped for 24 hours. Installing the soundboard and stringing it is meticulous work, done to precise specifications. Even the lettering on the cast iron soundboard is painted by hand. A new piano changes slightly after it settles and acclimates to a new environment. Steinway & Sons graciously agreed to ship the two finalists to Seattle for consideration, allowing guest artists to weigh in on the final selection, including Jean-Yves Thibaudet, Lang Lang, András Schiff and Alexander Melnikov. During this second phase of testing, the choice soon became clear as pianists made their concert instrument selections. The final selection was made in February — a thrill for the orchestra and Ludovic Morlot, and each visiting pianist! The new piano, nicknamed “Helen,” is a treasured addition to the Symphony’s collection and will be enjoyed by musicians and audiences at Benaroya Hall for years to come. The Seattle Symphony thanks Judith A. Fong and Mark Wheeler for making the purchase of our new piano possible, and encourages everyone in our Symphony family to join us in welcoming “Helen” to her new home in Seattle.